LEO is proud to have been named Learning Technologies Company Of The Year - UK in the 2017 Learning Technologies Awards, with the judges praising LEO’s commitment to delighting clients and providing exceptional learning experiences based on market-leading creativity and quality. Awarding Gold to LEO at the prestigious industry ceremony, the Learning Technologies judges said LEO’s work “scores on every level” and was “very compelling”. The judges also singled LEO out for having “thought deeply about how to be the best”. "It's a great honor to be recognized with two Golds at this year's Learning Technologies Awards", said Dale Solomon, Managing Director of LEO, who was part of the team to receive the accolades at a gala ceremony in London. 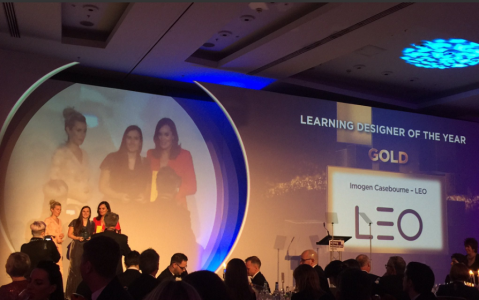 In addition to Company Of The Year, HR and Learning Director, Imogen Casebourne, won Learning Designer Of The Year for her innovative contributions to transformational learning programmes. Reflecting on Imogen’s impressive 20-year career, the judges noted her consummate ability to understand user needs and client briefs, and said her skill in creating original, beautiful learning stood out. Imogen, who is currently doing a doctorate on mobile learning through the University Of Oxford, caught the eye of the committee for a portfolio demonstrating “excellence and versatility” across a variety of projects, approaches, and technologies. These included interactive eLearning, simulations, blends and the co-design of gomo, an award-winning authoring tool and sister company to LEO. “It is a great honor to receive this award”, said Imogen. “All learning projects are team efforts. This is an acknowledgment of all the talented and committed people—both the wonderful creative teams at LEO and the many dedicated and discerning clients and consortium partners—whom I have been fortunate enough to work with over the past few years”. The awards, which were contested by companies from around 30 different countries this year, celebrate the very best in learning technologies from around the world. Judged to the most rigorous standards by an independent panel of more than 40 industry experts, they recognize the achievements of organizations providing outstanding learning solutions. Click here for the full list of 2017 Learning Technologies Awards winners. LEO believes that technology-enabled learning innovation has the power to deliver truly transformational results. Our purpose is to help clients deploy learning technology to deliver outcomes precisely aligned to their business goals. Backed by more than 30 years of experience, we design engaging learning architectures that fit seamlessly into businesses and improve performance throughout the entire organization. LEO has the deep understanding of learning design and technology, and pioneering creative approach, necessary to drive learning transformation. LEO’s expanding global customer base includes organizations such as PwC, the NHS, Civil Service Learning, Jaguar Land Rover, Volvo, Virgin Atlantic, Novartis, Godiva, Volkswagen, Dunhill, KPMG, Roche, Sainsbury’s and Mars. For more information, visit LEO. "It's a great honour to be recognised with two Golds at this year's Learning Technologies Awards. Company Of The Year is what all organisations aspire to" – Dale Solomon, Managing Director of LEO.